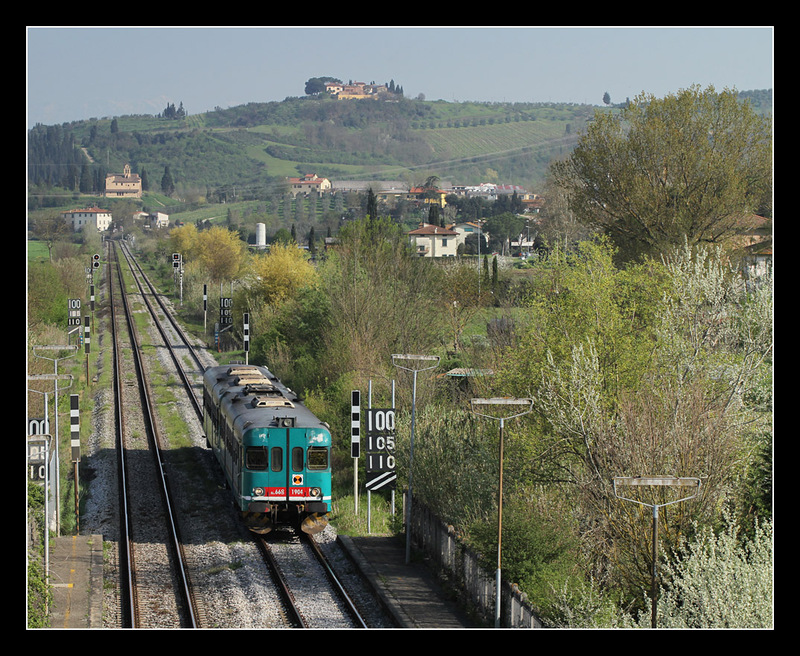 We return to Cambiano north of Castelfiorentino on the along this section double track diesel line Empoli - Siena. I had assumed position on a street bridge as one of the few spots offering a clear view of the railway. Morning light still was slightly dimmed, also due to the fact that obviously half the Tuscan fields were being torched that day. My main reason for visiting this spot was the panorama featuring not only a lovely landscape of rolling hills and trees in springtime bloom, but also the snowy peaks of the Apuan Alps in the distance. 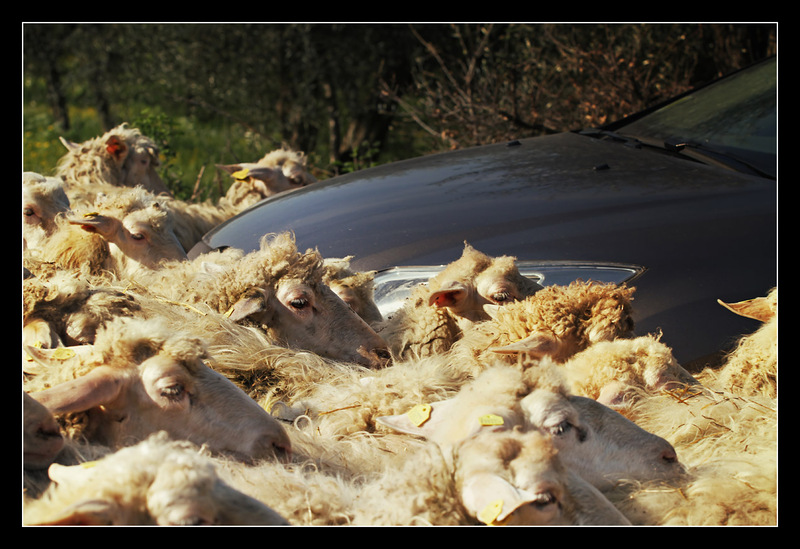 Later on the trip I was about to pay them a closer visit. 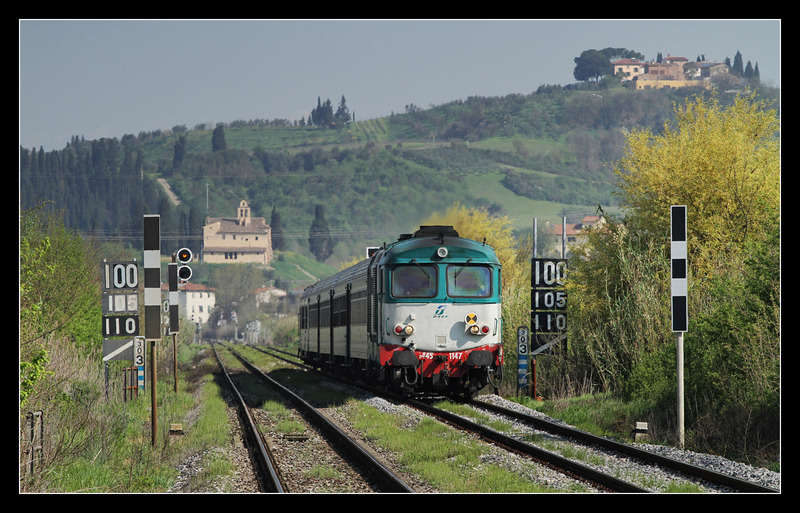 Shortly before 9 a.m. D445 1143 hauled its R 11755 towards Siena. 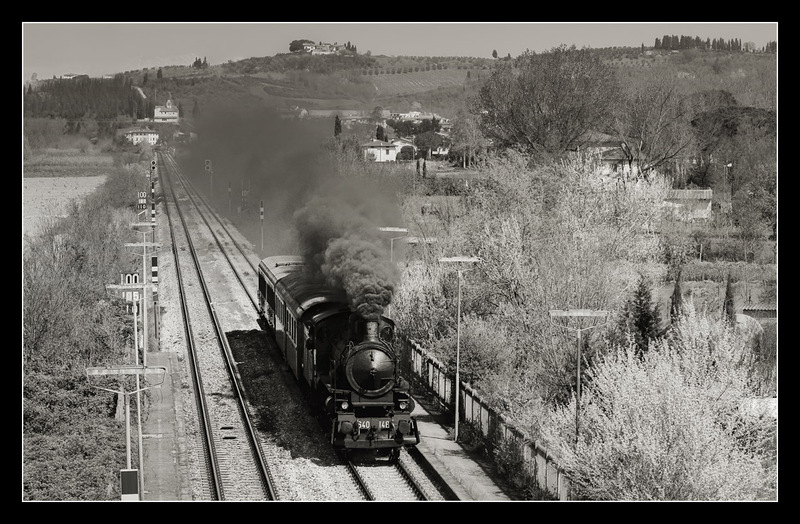 On the other side R 11758 Siena - Firenze S.M.N. 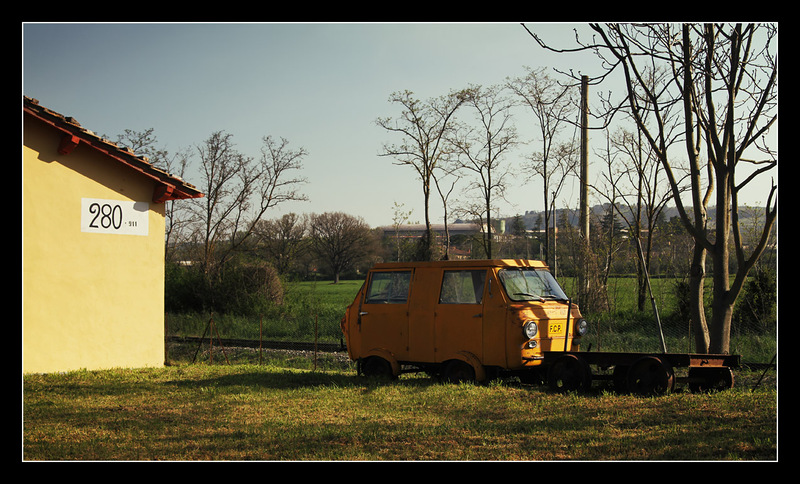 passed abandoned Cambiano halt, driving van trailers always faced this direction. Whoever thought services on such a prestigious line to tourist destinations would be mainly operated by modern Minuetto-DMUs - not at all! 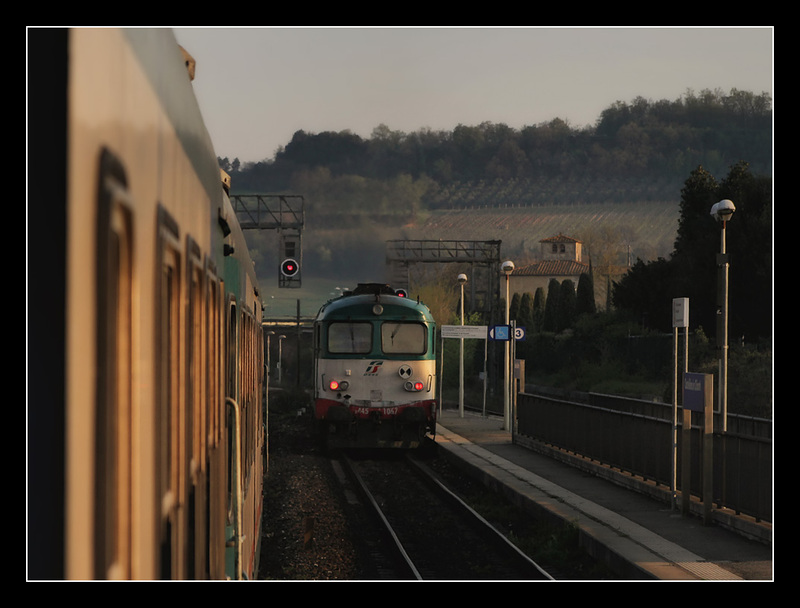 I spotted - with a few exceptions - class ALn668 as local trains, like R 23467 Empoli - Siena, as well as push-pull trains hauled by class D445 diesels on semi-fast trains directly to Florence. Another reason for my wait on this line was the Railway Touring Company steam charter which I already had caught in the Apennine Mountains two days earlier. Today the Brits were about to depart from Florence with destination Siena. 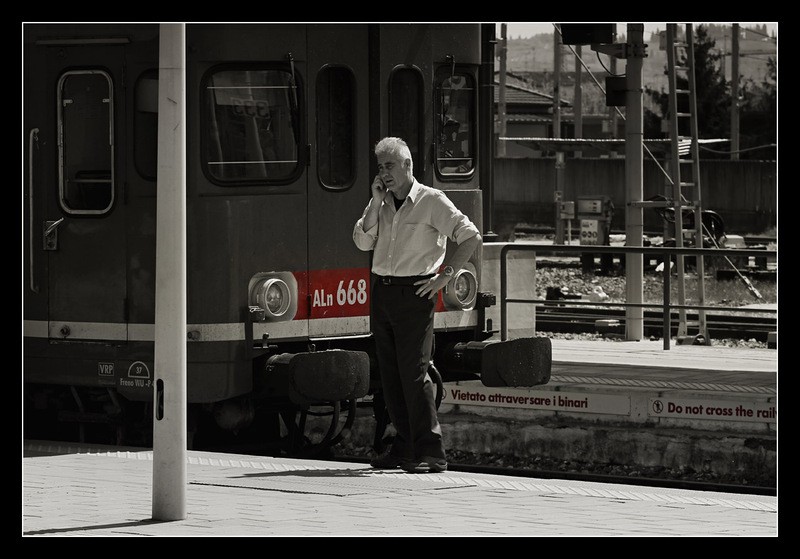 Only problem - as always, if you do not know the exact timetable of a special (and even then I have had painful experiences ;-)): the train could come at any moment. This meant that moving to another spot was no good idea, I prepared for a long wait. However, at quarter to 10 something unusual turned around the corner... ermmmm - had the steamer broken down, did they use a replacement diesel? Nope - D345 1120 with freight! Well, it would have been surprising as English charter trains rarely depart before 10 o'clock. So, I walked downstairs onto the platform to capture the following regular service, next to a train stop shelter smeared with neo-nazi slogans. Obviously recently freed from graffiti D445 1147 conveyed R 11757 to Siena. Afterwards I sat down comfortably in waiting position and just occasionally took photos of nice trains like R 23464. Subsequently an almost hour-long gap inbetween trains was scheduled. Shortly before 11:30 it was time, 640 148 - the same loco as on monday - turned around the corner, smoking mightily as always. Despite hazy spring weather the snowcapped mountains in the distance still were visible at noon, that's what I had hoped for. Of course it would have been best on a clear winter day. After all these photos from the spot a b/w version cannot hurt. 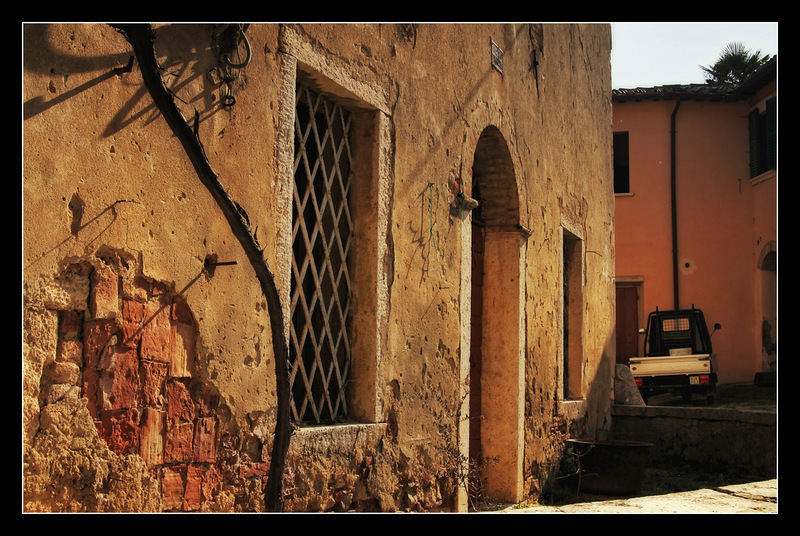 I walked back to Cambiano village, in Tuscany you have to keep an eye open on every corner for picturesque scenes. I had thought the bus service would terminate at Piazza della Vittoria and got off, then it overtook me on the way to the station. Oh well, it did not matter, as everything was in sight already anyway. At first I tried to buy a ticket to Lastra a Signa at the machine and queued behind an Asian lady. She soon gave up and so did I, as observed a few times the network connection of the machine seemed erratic, resulting in long wait times. 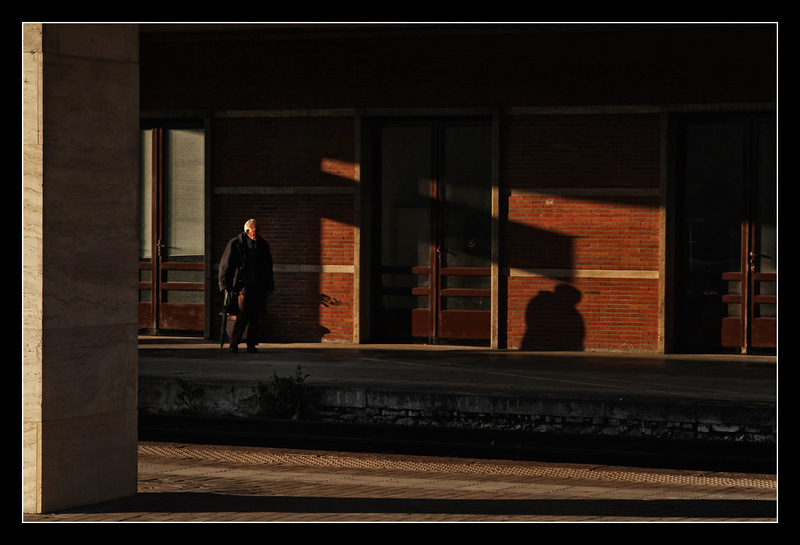 Luckily larger Empoli station still featured a ticket counter, there the purchase only took a second. 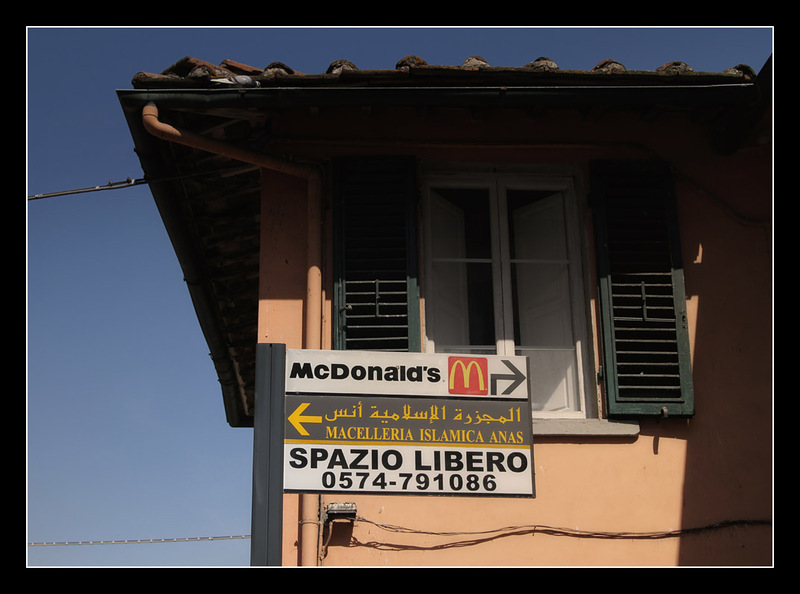 If someone was of the mistaken impression infrastructure would not be properly maintained in Italy: even the undersides of signs were cleaned! 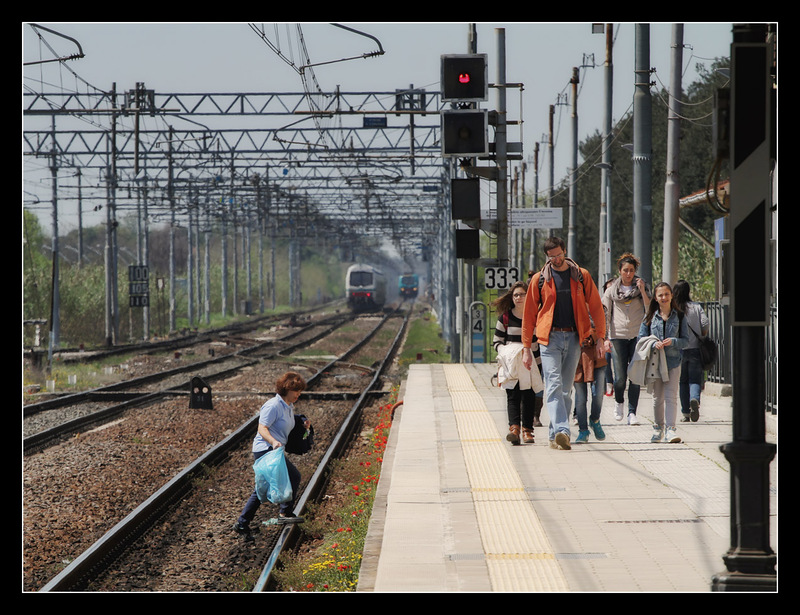 View along the line from Florence to the sea, only a Trenitalia employee with garbage bags crossed the rails. Cliché for the lunch break at Empoli. 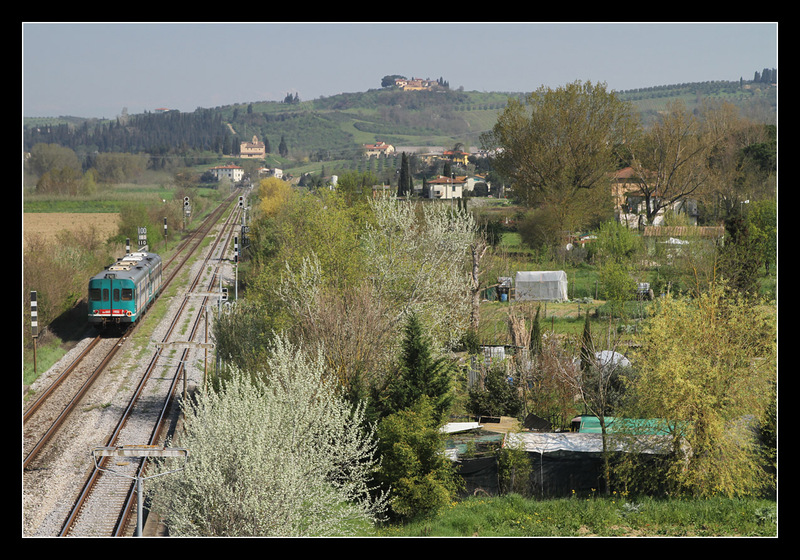 As nothing was running on the old line through Arno valley to Signa for some time, I took a train on the newly built bypass to Lastra a Signa. 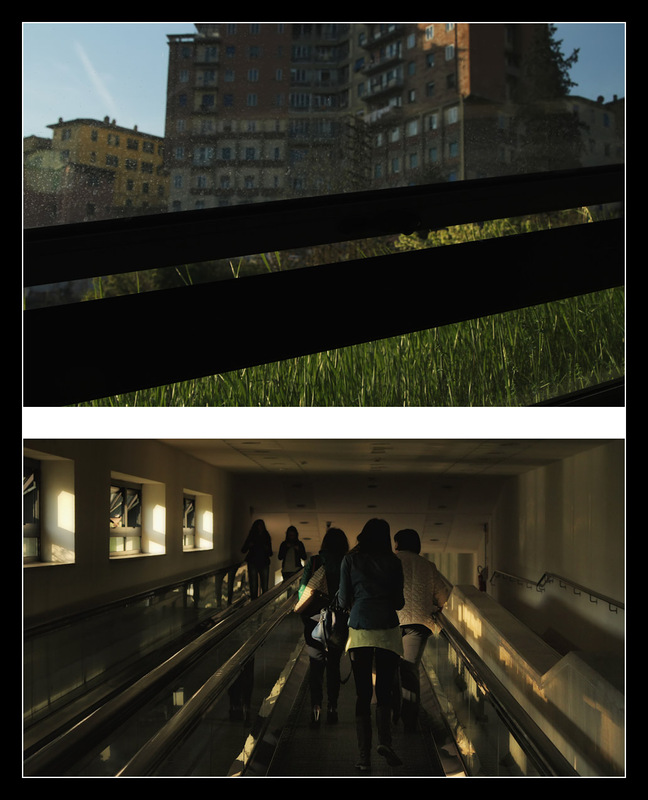 From there I had a longer walk, after crossing the Arno I captured this housing estate balcony view. An afternoon to relax was planned, so I took a seat at Ristorante Enrico opposite Signa station, I already had passed by there several times. Sardinian kitchen was on offer, the amount of locals eating lunch on the terrace was encouraging. I ordered excessively, but since I only visited a restaurant one more time on the trip this was justified. The courses I got served were excellent, first Spaghetti Calamari, afterwards - since pizza was also offered during lunchtime here, which is untypical of Italian restaurants - Pizza Frutti di Mare. I especially liked the sauce enriched with olive oil and basil on it, I could have eaten the pizza without any topping. After concluding with an Espresso doppio I tumbled home, fortunately it was not far to the hotel. In the afternoon I had to work on my laptop and rested in my room, only disturbed by two slight earthquakes. Still, an evening walk had to be on the menu, near Signa quarry ponds had been transformed into recreational areas. 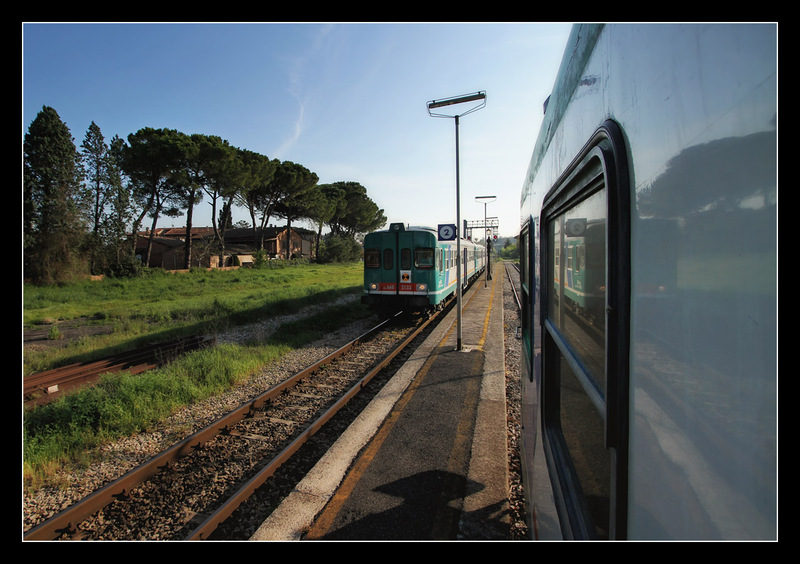 Here I had discovered open spots along the line to Florence from the train. Through Via dei Renai - Signa's back alley - I walked to Parco dei Renai which was open until 7:30 p.m. and even offered a pleasure island. 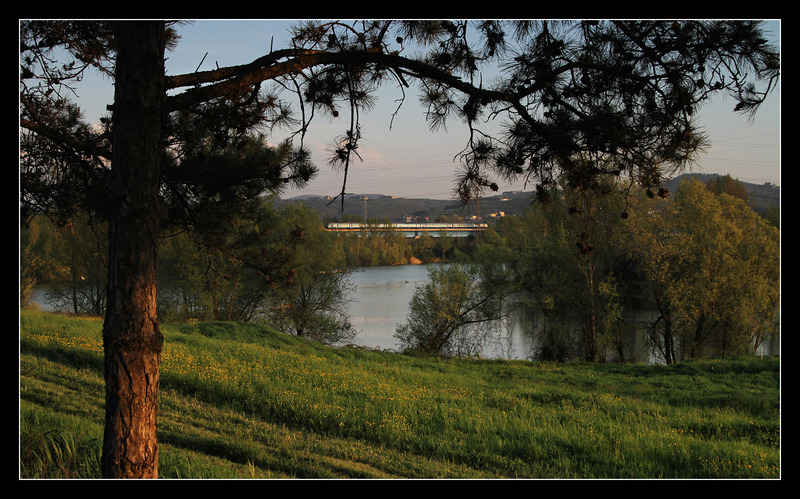 Once the Arno flood plains probably extended here, nowadays the river is highly regulated in this section. 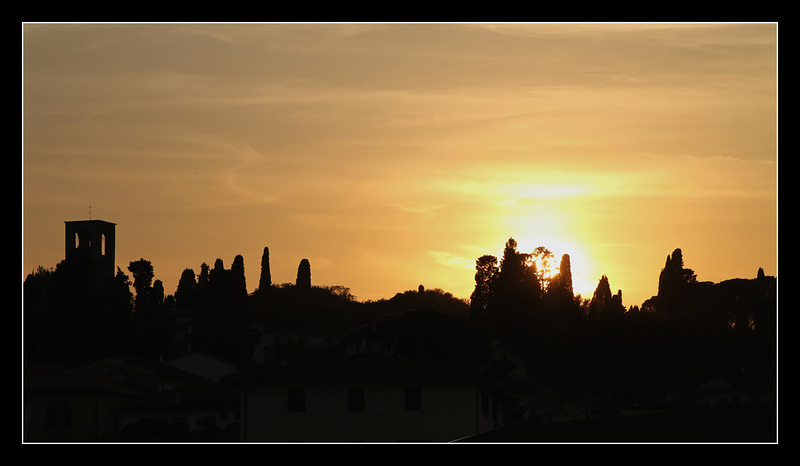 Parts of Florence and surroundings did not convey authentic Tuscan atmosphere, but it was fine for a few evening light shots. 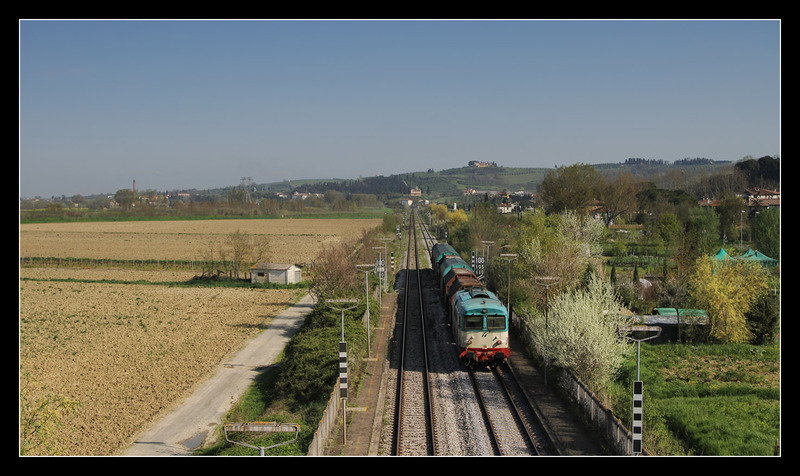 In the picture we can spot the new line on the bridge leading via Lastra a Signa to Empoli, on the ground below the old line through Arno valley with the same destination. 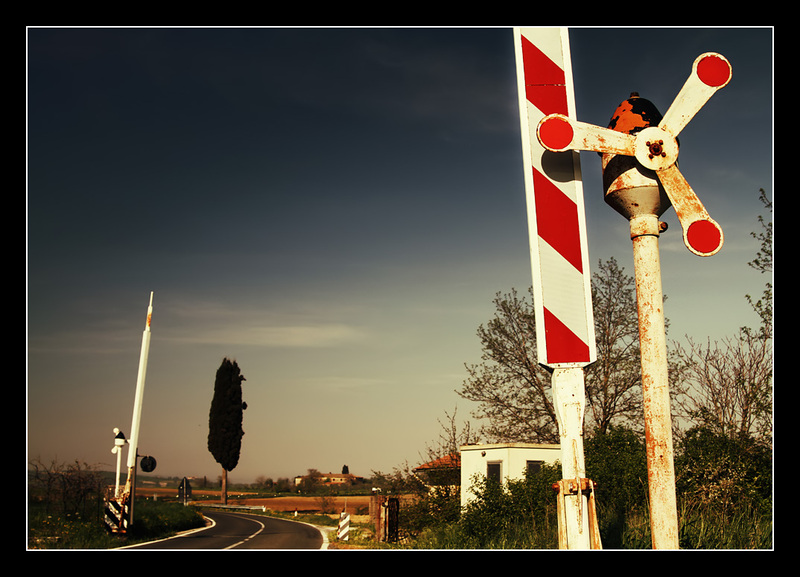 The junction was situated not far away in the background near S. Donnino Badia halt. 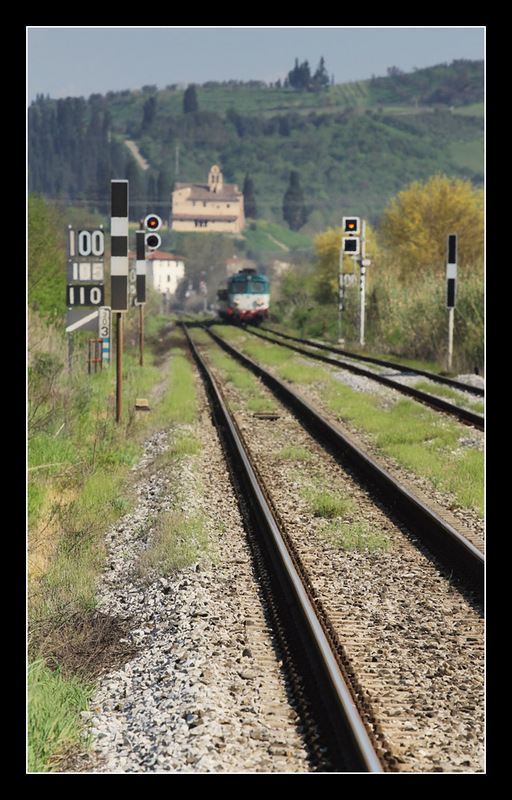 On the lower line I saw for example a freight train with E656 in old livery from the distance. 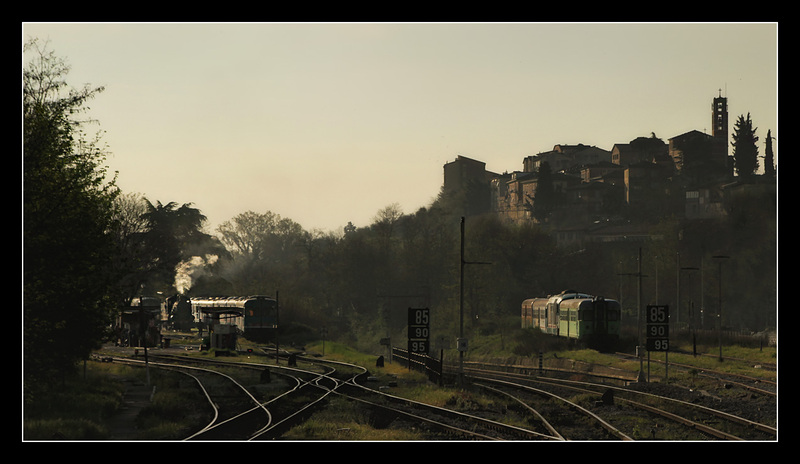 On another lake a class D445 thundered up the ramp hauling R 11781 towards Siena. On the way back to the hotel I visited a wine store, where Montalcino was filled straight from the barrel into a bottle which I took as a souvenir. As contrast I also shopped for supplies at the Penny Market opposite the hotel because the local grocery shop already was closed. 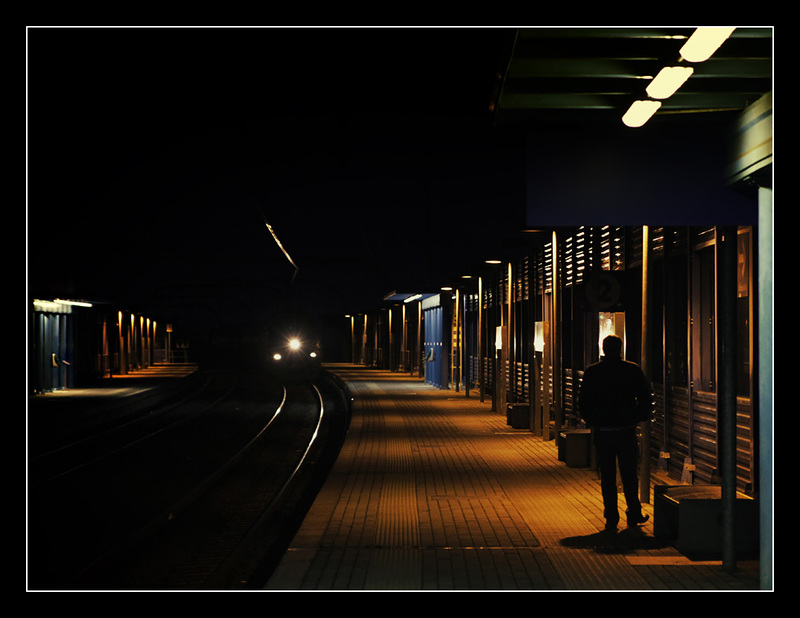 Next morning I departed early again, if not taking the first train from Signa. 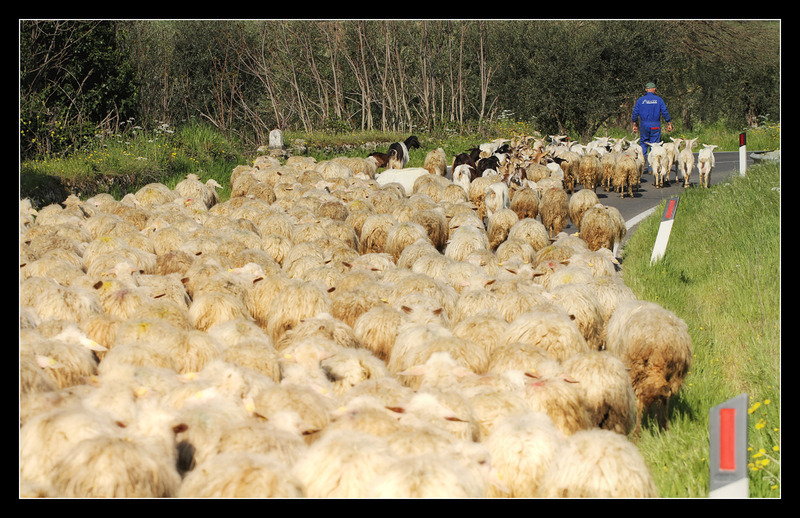 The later departure at 5:51 a.m. was bought by a longer march to Lastra a Signa. I had that much time to spare, I bought almost all remaining local train tickets at the machine. Even at that time of day it lost network connection once. 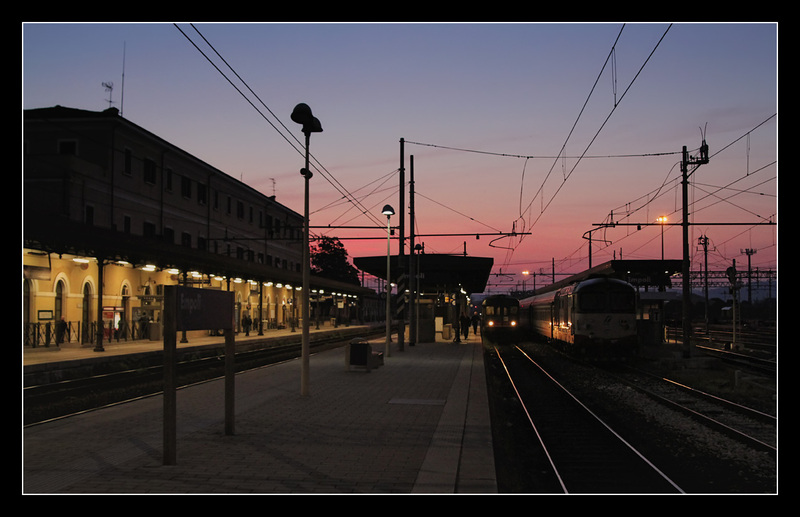 Let the shroud of darkness conceal the beauty of this prettiest Tuscan railway stop! 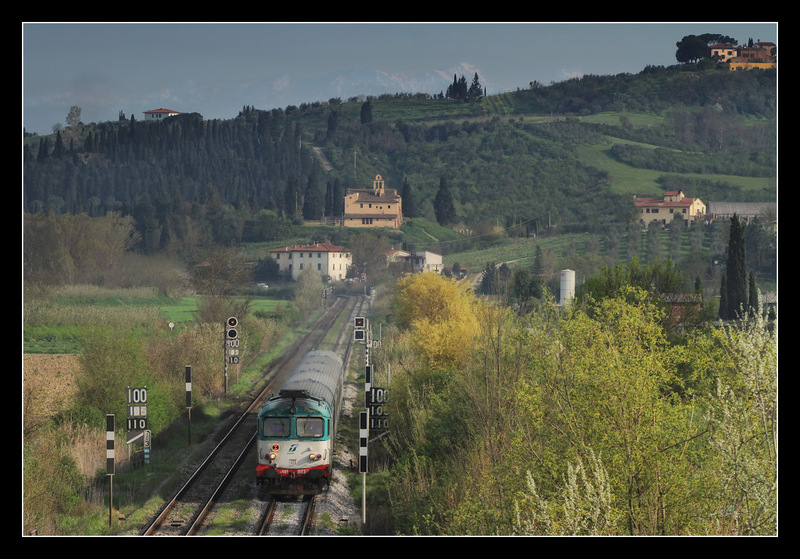 A short hop to Empoli later ALn668 3208 stood ready as R 6859 to Siena. 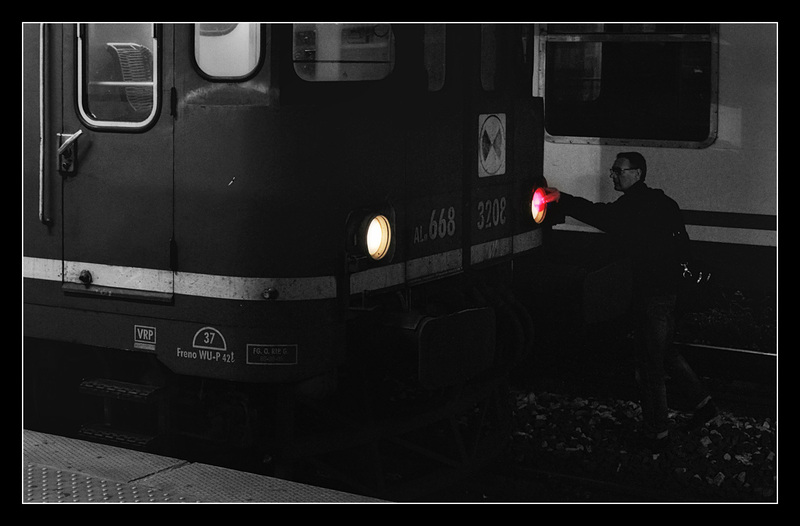 Whoever thought that you could change direction of lights at the flick of a switch on this vintage Fiat railbus: nope! 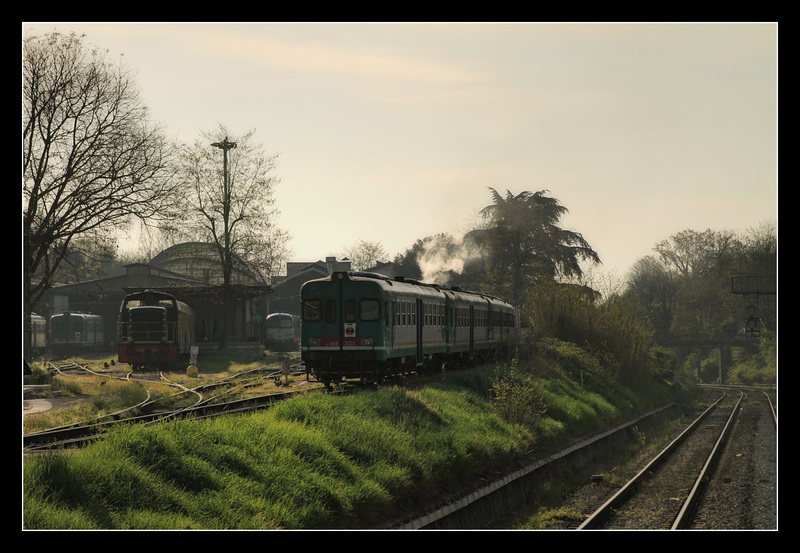 Classics ready to depart at Empoli. 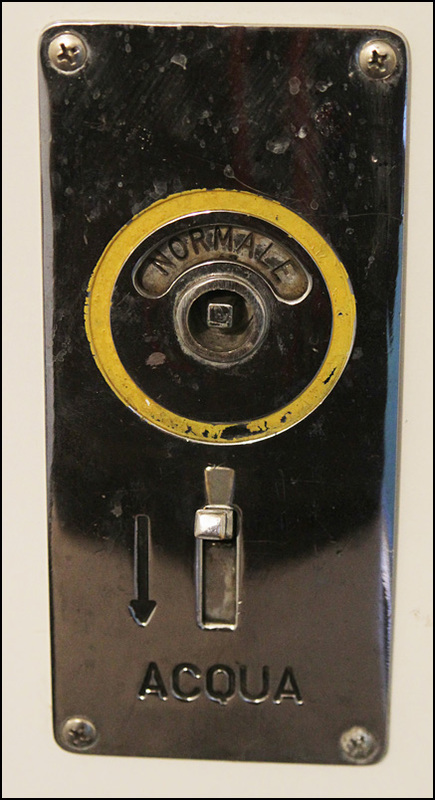 Sadly - or thankfully - I did not carry a square box spanner to find out. 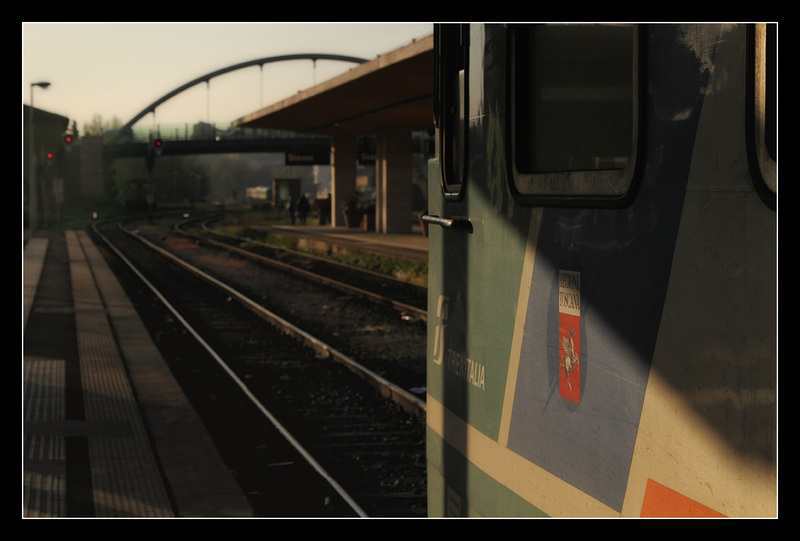 What is nicer than enjoying the amazing Tuscan landscape at sunrise through an open train window? 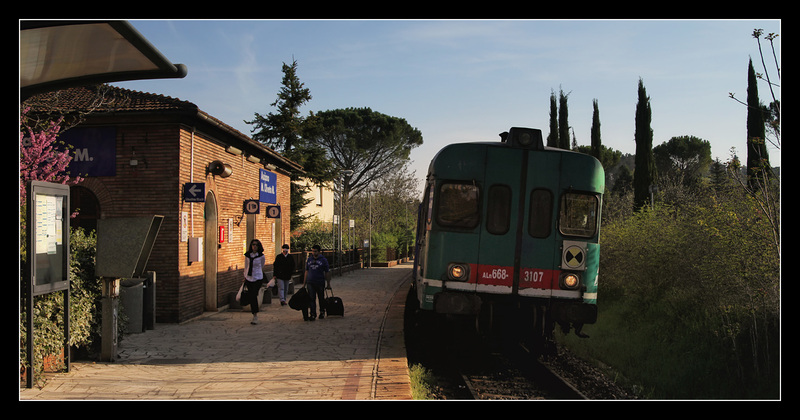 From Castelfiorentino the train filled increasingly with commuters, but never became overcrowded. 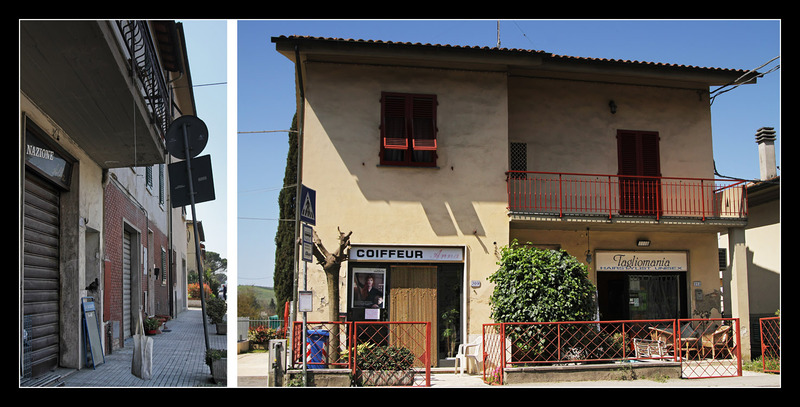 A stop of five minutes was scheduled to cross R 11756 at Castellina in Chianti at the edge of the wine region of same name - Cheers! In the afternoon I was about to return. Cheers again! We arrived punctually at Siena. 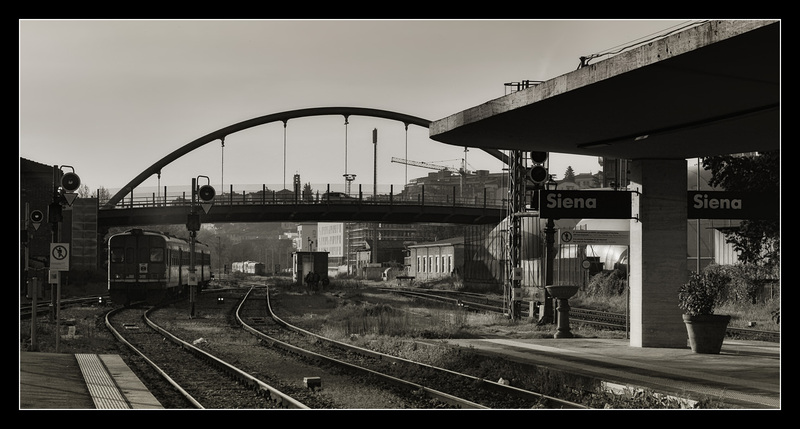 Modern Siena station is located in a valley away from the historic centre, so no railway photos with the sights are possible. I had some time to change trains and was absolutely shocked: last time I had been here ten years ago, this had been constructed since: inside the station you could find an Americanised shopping mall, at the entrance a bakery featuring donuts! In Italy! 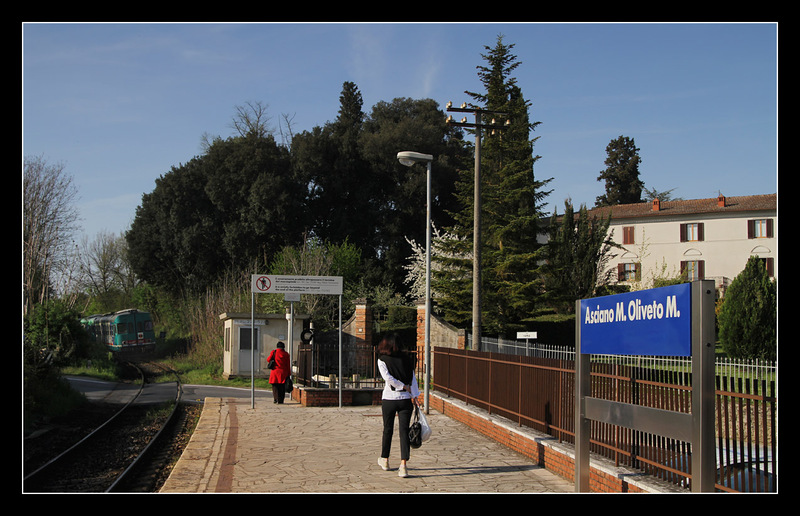 I did not manage to ride to the top as my next train awaited me: R 6903 towards Chiusi-Chianciano Terme. Apart from one modern Minuetto DMU only class ALn668 were to be seen. Upon departure we approached this lovely scene: 640 148 was just being prepared for the day in the depot. 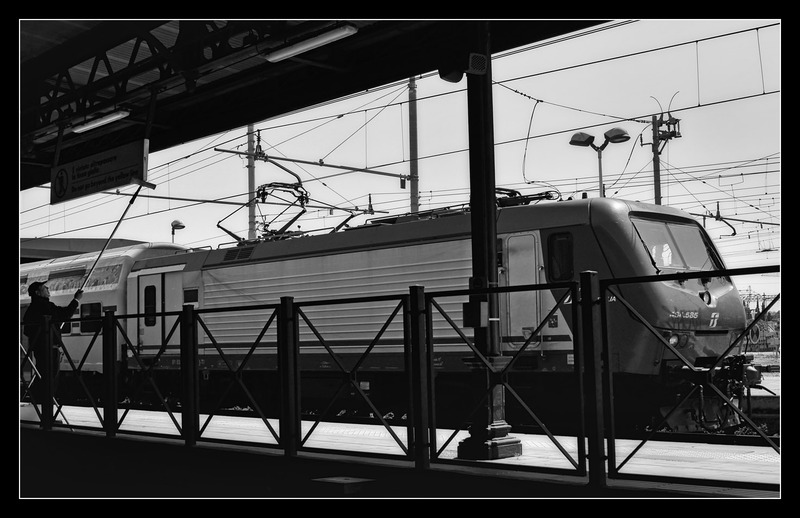 Even without steamer in view I caught this nice parade of various vehicles while my train rolled down the southbound lines out of Siena. 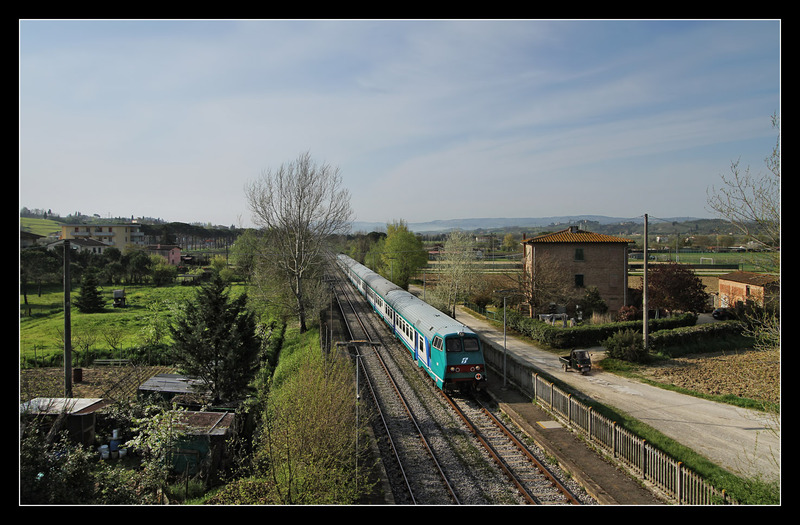 Interestingly the line which would later turn westwards to Grosseto and the coast was being led on the eastern track, we were about to cross under it behind a loop near Abbadia. Soon afterwards at Arbia we met R 6906, which did not stop here. 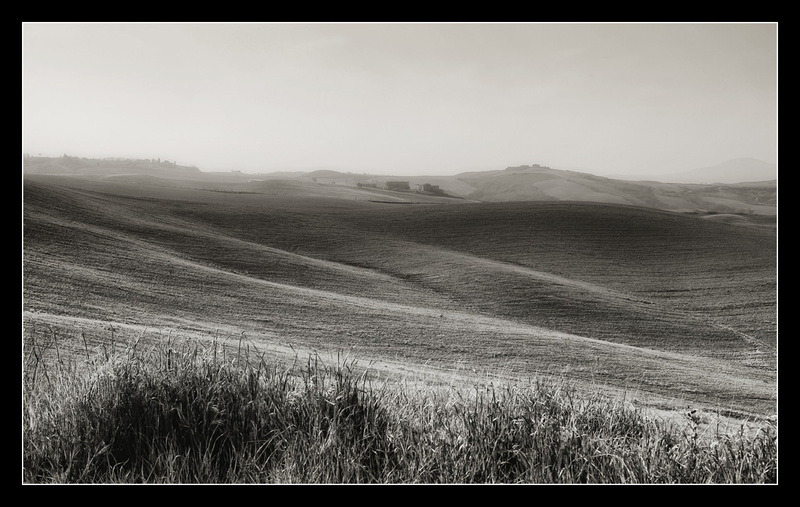 Subsequently we traversed ever sparser landscapes, the heart of Tuscany really lay here. 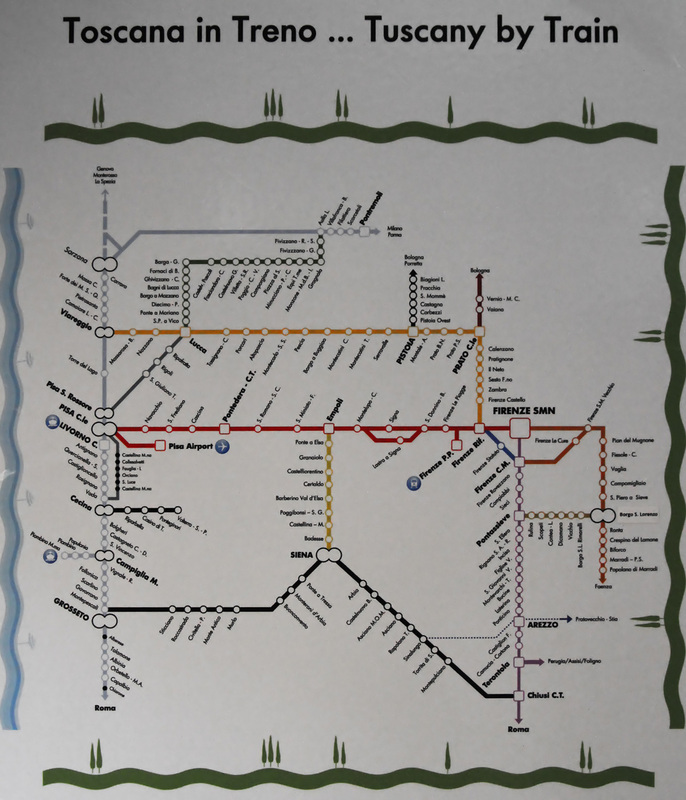 Stopping patterns along this only around rush hours frequented line generally seemed obscure. Some trains halted at completely different stations than others. 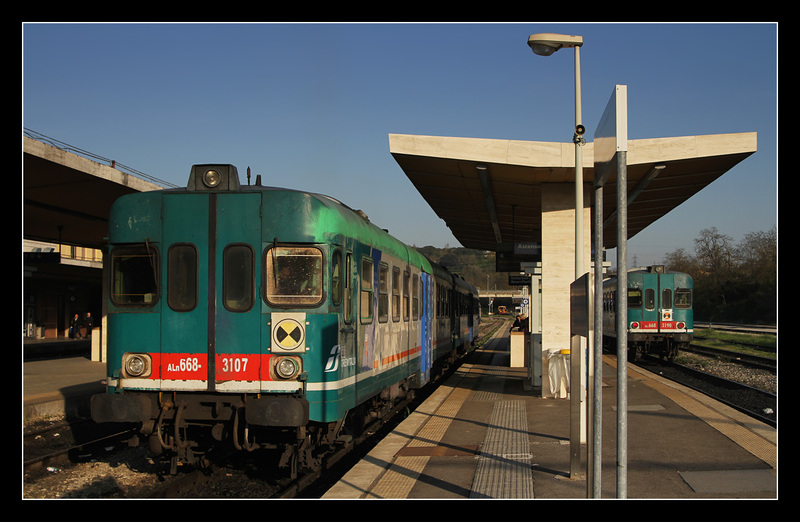 At Asciano my train for example stopped at the city halt Asciano M.O.M. 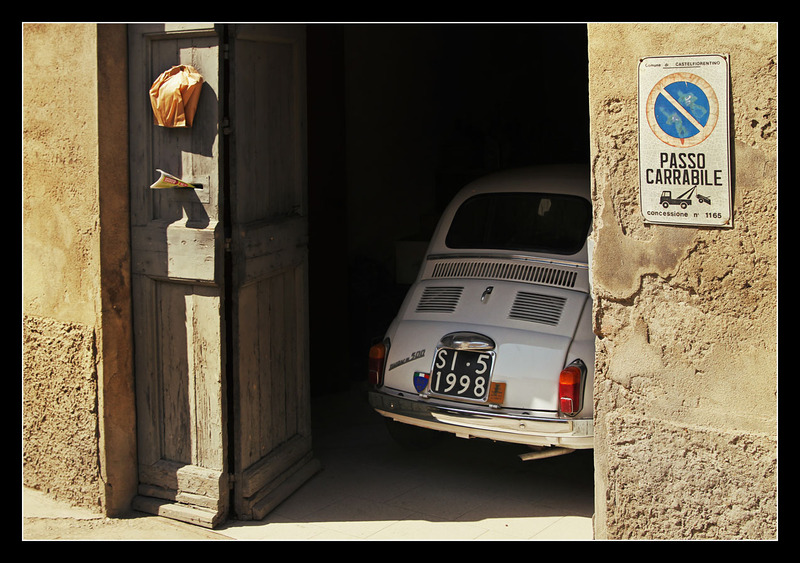 (Monte Oliveto Maggiore), not at the station located behind a horseshoe curve at the other end of town. Raising some dust the railbus bubbled through the thicket along the curve. 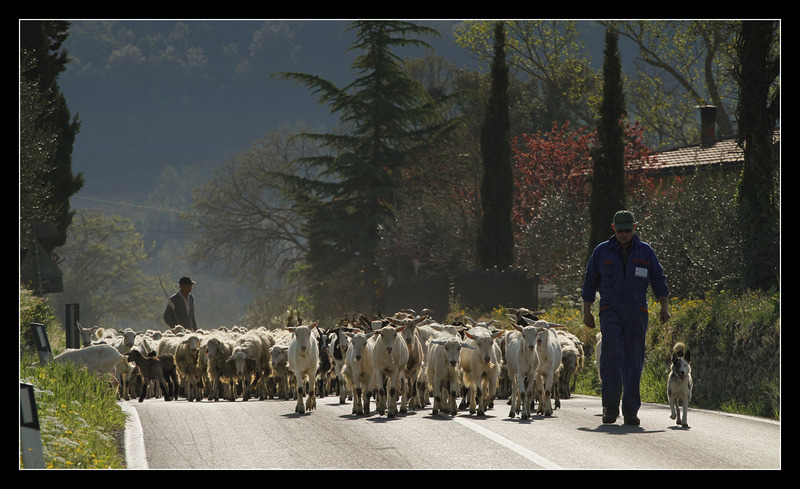 So, I had an even longer march on foot through Asciano in front of me: about six kilometres into one direction to Aia Vecchia Di Montalceto ("aia" is a barn floor). However, considering the encounters on the way I would not exchange an inch of it against something more comfortable. Even in town no pavements were available, a female passenger from the train walked on the opposite side of the road. 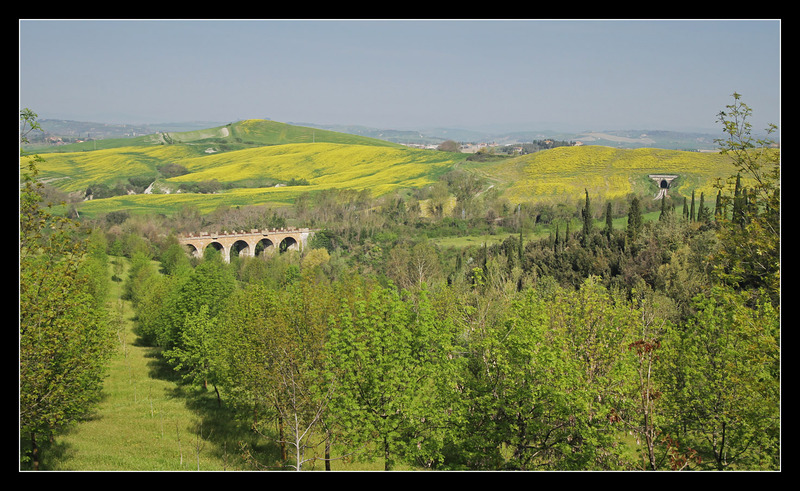 As soon as I left Asciano behind I walked along an open road through lovely rolling hills. Near a farm a rather stout local in a tracksuit jogged past me on a training round. 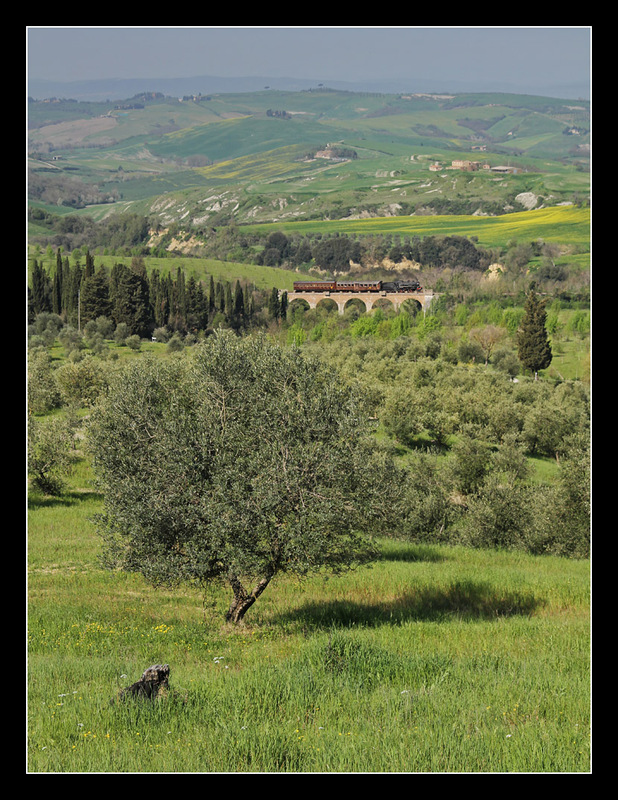 Tuscany - as if it had been painted. 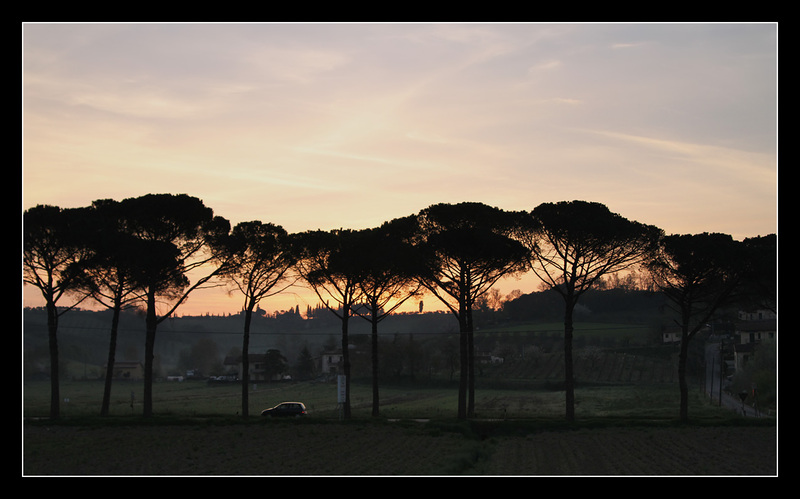 A Piaggio-tricycle cannot be missed from the scenery. Near the level crossing a draisine was exhibited. I stood at the roadside and was left unharmed, other obstacles were taken by running until they bumped against it. 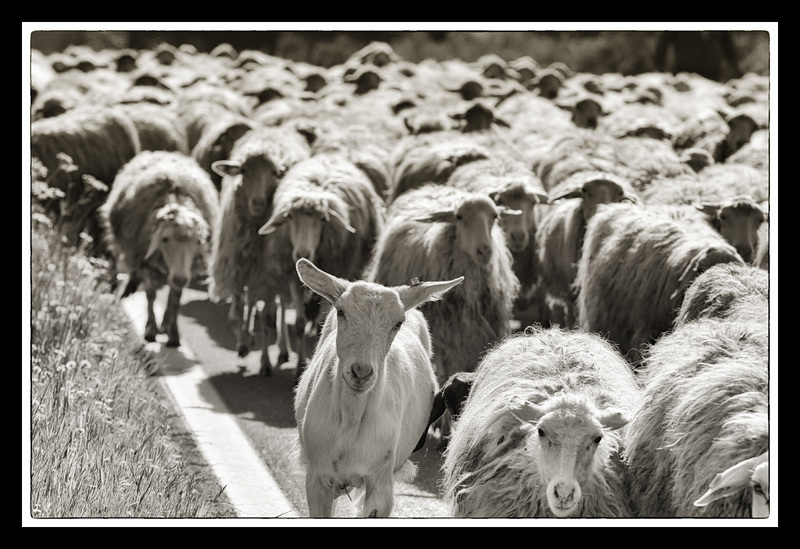 After a short time the sea of sheep had waggled past me. 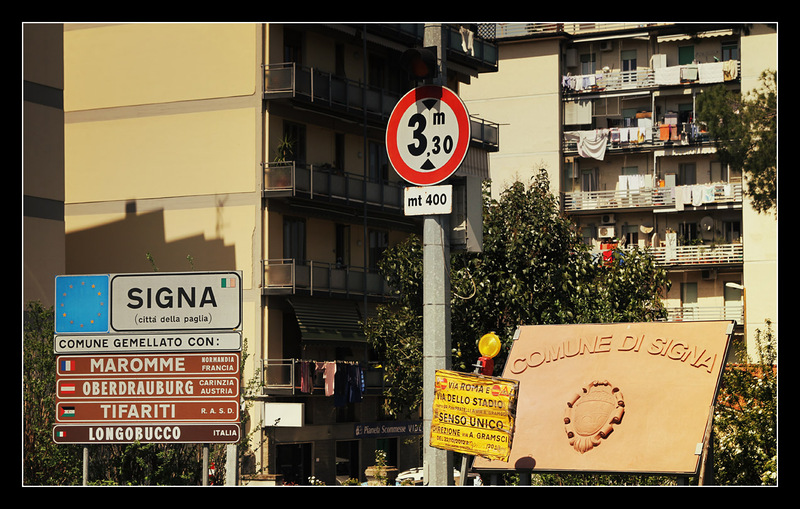 At Oliviera I turned from the main road onto a gravel one, "Aia Vecchia Di Montalceto" was inscribed on a signpost. 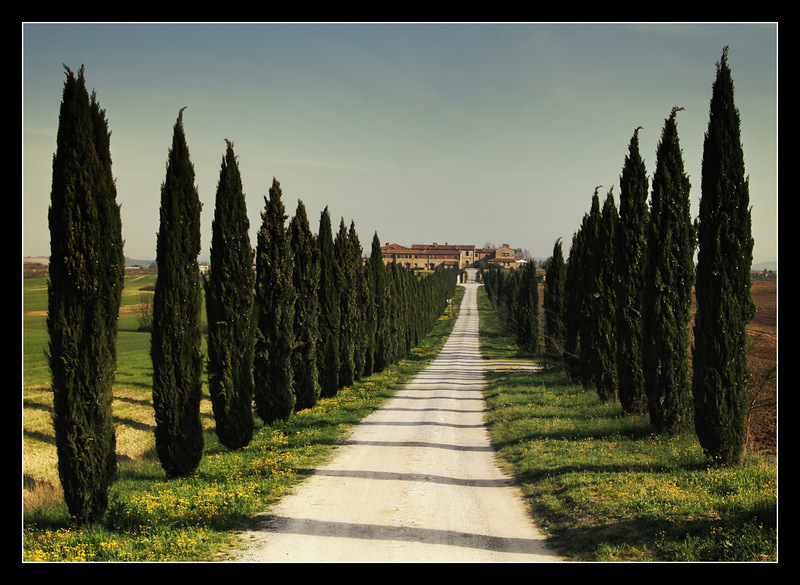 On the way you walked through Poggio Pinci estate featuring picturesque insights. Then I had reached my destination. Comparing images I had been able to locate the place on Google Maps, but somehow it looked differently. 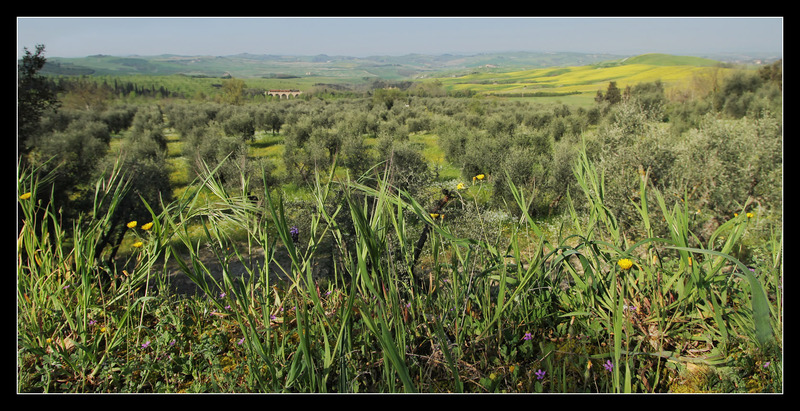 The landscape was not as treeless, an olive orchard could be found in the foreground. Only at home I noticed that it was not the same viaduct in the photos, but a larger one could be found on the other side of the hill. 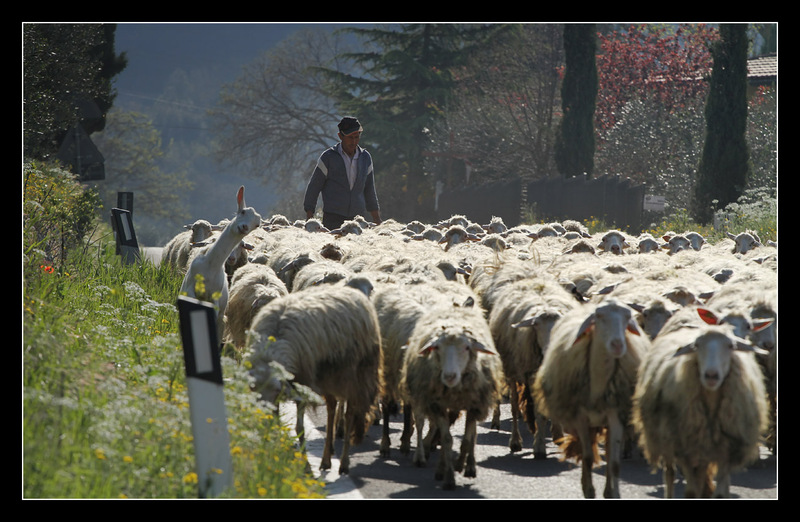 Additionally, dogs were constantly barking at Aia Vecchia, where agrotourism was on offer, an omnipresent feature in Tuscany today. So, I looked for another spot. Instead of continuing, in which case I probably would have come across the other viaduct, I walked uphill through olive groves. What to do? Well, there was to much to see in this area to wait until the train would pass some time in the afternoon or evening. 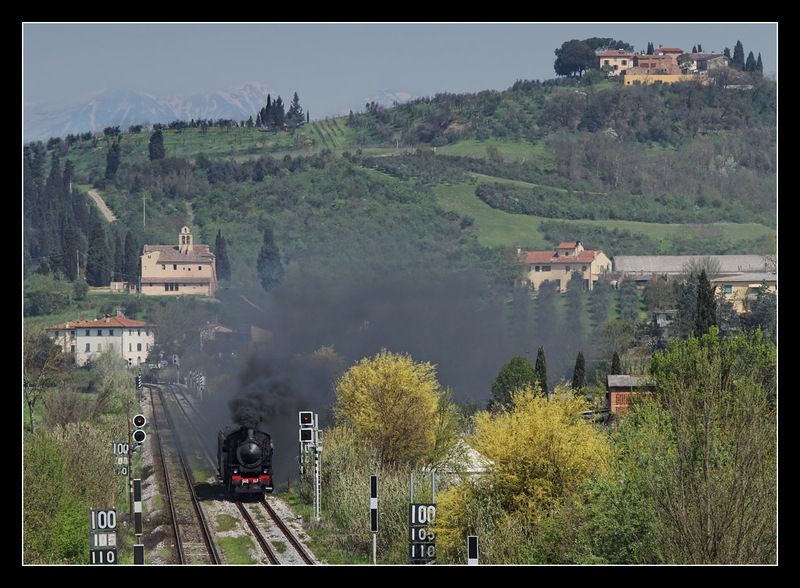 Originally I had planned to visit the high speed line Florence - Rome, but that was quite a long way and I already had experienced high speed traffic unexpectedly in the Apennines. 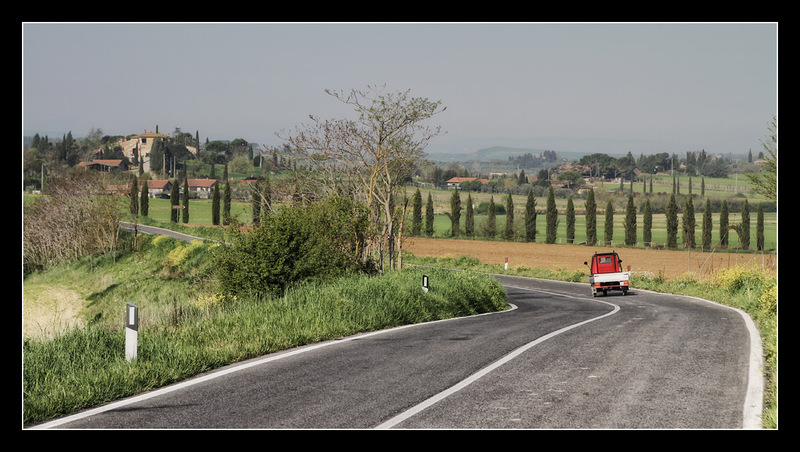 However, the vehicles operating on the line to Siena had been a positive surprise, so we are about to taste a little more of Chianti in the next report. Despite this insight and the long march I was not disappointed at all, I had enjoyed the Tuscan feeling since morning too much. And if I had not walked exactly at that time and place, I would have missed those wonderful encounters. Of course I already had taken many variations of landscape photos in nice morning light, so I hope you can forgive me the application of Virtual Train (tm) - naturally using cutting edge techniques like measuring satellite images and comparing historical photos. The scene would have taken place exactly like that the same day, just backlit by the afternoon sun. More impressions from this amazing scenery follow next time. Gorgeous photography. I need to take a trip to Europe.